Republished December 20, 2013, text was modified to clarify content. The U.S. Energy Information Administration (EIA) does not anticipate an immediate impact on global liquid fuels supply following the November 24 announcement of a Joint Plan of Action (JPA) between Iran and the five permanent members of the United Nations Security Council (the United States, United Kingdom, France, Russia, and China) plus Germany (P5+1) on Iran's nuclear program. The JPA does not directly allow for additional Iranian oil sales, although it does suspend sanctions on associated insurance and transportation services to those countries already granted import waivers. The imposition of sanctions on associated insurance and transportation services by the European Union (E.U.) had a significant effect on Iran's exports when implemented in July 2012, but Iran has been able to create arrangements that allow it to export limited quantities of oil to several countries. EIA does not anticipate those countries significantly increasing their oil imports from Iran, so without an easing of sanctions covering Iran's ability to sell additional oil, the country is unlikely to significantly increase its production or exports in the short term. Iran's total liquids production and exports declined significantly as a result of sanctions imposed on its energy sector, and the recent JPA is not expected to significantly impact the existing sanctions regime for at least the next six months, according to official U.S. Department of State statements. EIA estimates Iranian crude oil production was 2.8 million barrels per day (bbl/d) in November 2013, down from an annual average of 3.7 million bbl/d in 2011 and 3 million bbl/d in 2012. Crude oil exports averaged just 1.1 million bbl/d over the first nine months of 2013, down from 2.5 million bbl/d in 2011 and 1.5 million bbl/d in 2012, according to the International Energy Agency. Existing United States and E.U. sanctions target Iran's petroleum exports and imports, prohibit large-scale investment in the country's oil and gas sector, and cut off Iran's access to European and U.S. sources of financial transactions. Additional sanctions target the Central Bank of Iran, while the E.U. imposed an embargo on Iranian oil and in July 2012 banned European Protection and Indemnity (P&I) Clubs from providing Iranian oil carriers with insurance and reinsurance. European insurers underwrite the majority of insurance policies for the global tanker fleet, covering about 95% of tankers worldwide. The insurance ban particularly affected Iranian oil exports as lack of adequate insurance impeded sales of Iranian crude to all of its customers. Iranian exports dropped to less than 1.0 million bbl/d in July 2012 as Japanese, Chinese, South Korean, and Indian buyers encountered difficulties in finding insurance alternatives. By August and September of 2012, Iranian exports recovered somewhat as Japan, South Korea, and India began to issue sovereign guarantees for vessels carrying Iranian crude oil and condensate, and China and India began to accept Kish P&I Club—an Iranian insurer—guarantees on the vessels that shipped oil to their refineries. While the recent JPA suspends the shipping insurance ban, many of the countries currently importing Iranian oil are already using alternative insurers, thereby limiting Iran's ability to significantly increase exports. In 2012, Iran's net oil export revenues were significantly lower than the $95 billion generated in 2011. The upper bound estimate of Iran's net oil export revenues in 2012 was $69 billion, assuming that Iran was able to receive hard currency payments for all of its estimated exports and did not offer discounts despite the application of sanctions by the United States and the E.U. This upper bound estimate may significantly overstate the country's actual net oil export revenues. Oil exports make up 80% of Iran's total export earnings and 50-60% of government revenue, according to The Economist Intelligence Unit. 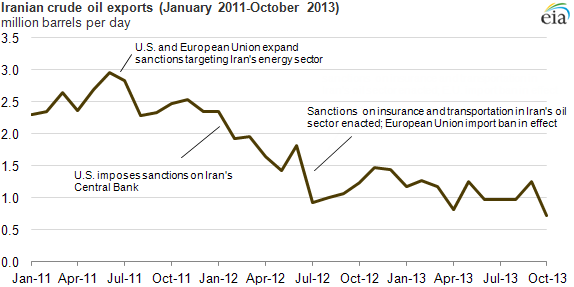 For more information see EIA's Iran Country Analysis Brief.